This first time ever DVD includes the definitive visual collection of Paul McCartney's amazing career featuring solo music videos, career-spanning live performances, personal commentary by Paul McCartney and exclusive footage that tracks his incredible musical journey as never before. 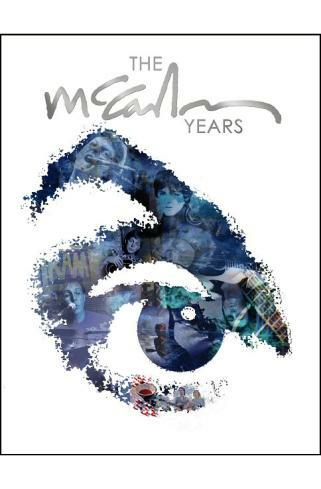 Spanning four decades The McCartney Years is a three volume DVD collection, featuring some of the world's best-loved music that has become the soundtrack to all our lives. Volume One and Volume Two contain the definitive collection of McCartney music videos. Starting in the 1970s with Paul McCartney's first solo single Maybe I'm Amazed, the DVD includes the Wings promo video for Band On The Run as well as hits from the 1980s such as Say Say Say, and the 1990s with Biker Like An Icon. It finishes with 2005's Fine Line. The films can be viewed either in chronological order or as play-lists that have been personally arranged by Paul featuring his exclusive voiceover commentaries. Volume Three includes live performances taken from three classic McCartney live shows; Rockshow filmed on Wings' 1976 World Tour, new edits of Paul's seminal Unplugged in 1991 and Paul's now legendary headlining performance at 2004's Glastonbury Festival. This collection has been meticulously restored and all films polished, re-graded and given a new lease of life in Widescreen format with re-mastered stereo audio and for the first time the original recordings re-mixed into 5.1 surround sound. The McCartney Years includes over 40 promo videos and over two hours of live performances.